At the beginning of the June 2013, Malawi’s President Joyce Banda and entourage attended the Fifth Tokyo International Conference on African Development (TICAD) in Japan were Banda also met with Executive Director of Japan Oil, Gas and Metals National Corporation (JOGMEC) Hideyuki Ueda. The fifth TICAD saw participants from 51 of Africa’s 54 nations meet with development partners to discuss development in Africa on the principle of African ownership in partnership with Asian countries and agree on the Yokohama Action Plan 2013-2017. This plan is built on promoting a robust and sustainable economy, an inclusive and resilient society, and peace and stability through private sector-led growth, infrastructure and capacity development, and empowering farmers as key economic actors, among other strategies. The Conference was launched 20 years ago by the Japanese Government, supported by the the African Union, World Bank and United Nations Development Programme. 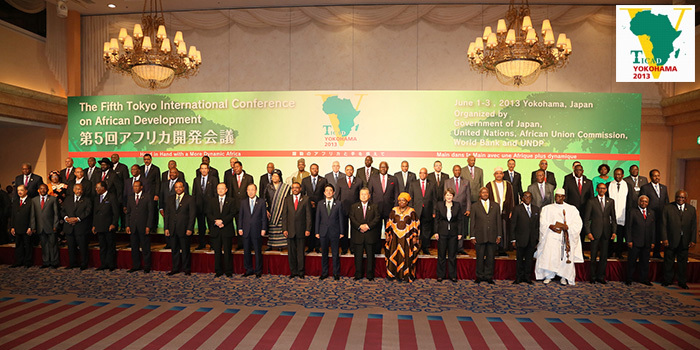 This year, the Japanese Government committed USD 32 billion to the continent’s development over the next 5 years. We are already on the ground in Malawi doing explorations in Mulanje, Thyolo, Lake Chilwa and Mangochi on Rare Earth which has key elements for manufacturing of batteries among other things. Malawi’s geologists are also actively involved in the project, thereby enhancing their skills and knowledge, courtesy of the Japanese Oil, Gas and Metals National Corporation. I expressed gratitude for the diligent and hardworking engineers that Malawi provides us for training under JOGMEC expertise and technology transfer initiative. Our motivation to come into Malawi is not only to exploit the resources but also train local engineers and geologists that would contribute positively to the growth of their own economy. President Banda seeks further Japanese investors in this sector. The Japanese Government through Japan International Cooperation Agency (JICA) has begun to work with the Malawian Government to improve geological information systems (GIS). In a public-private partnership with JOGMEC, JICA is assisting in the collection, processing, and analysis of geological data using remote sensing to establish an integrated GIS database for mineral resources and in building the capacity of Malawi’s Geological Survey Department. JOGMEC has experience establishing and working with other centers, such as the Botswana Remote Sensing Sensor, and JICA is targeting Namibia, Zimbabwe, Mozambique, Botswana and South Africa, along with Malawi, for enhancing GIS systems. Currently, Malawi’s Geological Survey Department does not have electronic geological data except for a few old digitised geological maps from the colonial period (pre-1964). JICA’s future approach to natural resource development will require keeping in mind the possibility of public and private sector collaboration. It will endeavor to put together comprehensive packages of development assistance that will contribute to the development of the mining business in the partner country and ensure a stable supply of natural resources for Japan. JICA’s first began providing technical assistance to Malawi’s mining sector in 1977 in a development study of Ngana Coalfield, which is currently being explored by Intra Energy Ltd. Between 1986 and 1988, and in 1989, JICA sub-contracted a survey of the Chilwa Alkaline Area for rare earth elements to Metal Mining Agency of Japan; this is an area that JOGMEC is currently exploring in Malawi, according to Ueda’s remarks quoted earlier in this post. Japanese media indicates that China is Japan’s biggest rival in resource extraction. The international community needs to redirect its policies from one that has seen Africa as a perpetual aid destination to one that works with Africa. Africa has now acquired skills, knowledge and a vast network across the world. […] Africa has successful governments that have demonstrated that it is possible to close the gender gap and to empower its women to achieve development. The only other African female head of state, Liberia’s President Ellen Johnson Sirleaf, urged Japan to invest in Liberia’s private sector, while Zimbabwe’s Robert Mugabe issued a warning against neo-colonialism in a plenary session. Although it should be noted that the Zimbabwean Government signed a Memorandum of Understanding with JOGMEC to implement mining deals.